Great View, really friendly staff and comfortable capsules! The staff was so kind and helpful in finding things to do in the city. Only wish the dorm lights got a bit darker as the shade is thin but other than that no complaints! Location is great, staff are friendly. Only thing negative is the breakfast option but besides that its in quite area and right in the heart of Quay. Great value for the location. This was my first time staying in a “capsule” hostel and I really enjoyed the privacy it offered. My flight arrived after midnight and they were able to accommodate me with a late check-in. The only downsides are the number of bathrooms and the weak air conditioning. Other than that, I would definitely stay again! Super location, good vibes,no very good for easy wake up sleepers,guys...fix the showers...no hot water! 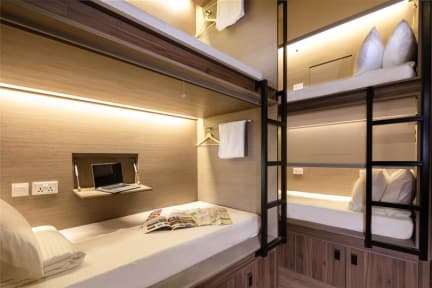 Good place if you’re looking for an affordable stay in Singapore! Location was great. The lobby area where breakfast was a bit too tiny for everyone staying even w/ the lounge upstairs. Capsules are quite large & comfy. Top bunk can be a bit scary to climb up too. Showers/bathrooms were clean. Slipper situation needs to be dealt with, one trips walking over shoes to get to showers. Female dorm is inside a mixed dorm with no windows. Air con does very little to keep room cool, it was a very hot sweaty two nights. For the price it was an over all ok stay. I had read reviews saying the hostel wasn't that great for meeting people but assumed that meant there wasn't much of a common room or bar etc. I still booked on my own but ended up finding the atmosphere was really off and there was only whispering the whole time in the room so no-one would speak to each other. I wish I'd booked somwhere else that would have made it easier to meet people. I also found the no shoes rule excessive especially when you were chased in by staff if you forgot. I only stayed one night at Beat Capsules at Boat Quay but that’s exactly what it’s good for, a place to sleep in a good location. The pods are really nice and private with the pull down shade for privacy and the bed was surprisingly comfortable. The showers however left a lot to be desired. The toilet is in the same tiny room as the shower which made it a little messy and we’re not the cleanest. But hey for the price, location, & nice beds, I’d recommend it.